Iceland’s scenery is world-renowned and world-class. It is a place photographers dream about visiting. Until we published the first edition of Forever Light, there were very few good in-depth resources on photographing Iceland’s natural landscapes. 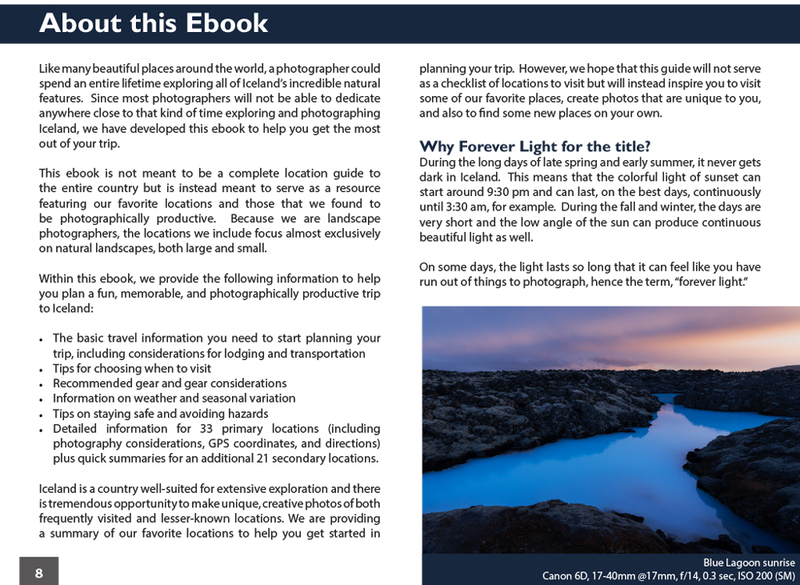 This e-book, Forever Light: The Landscape Photographer’s Guide to Iceland (Second Edition), is designed to fill this gap, help save you time in planning your trip, and get you to some of the best locations Iceland has to offer. 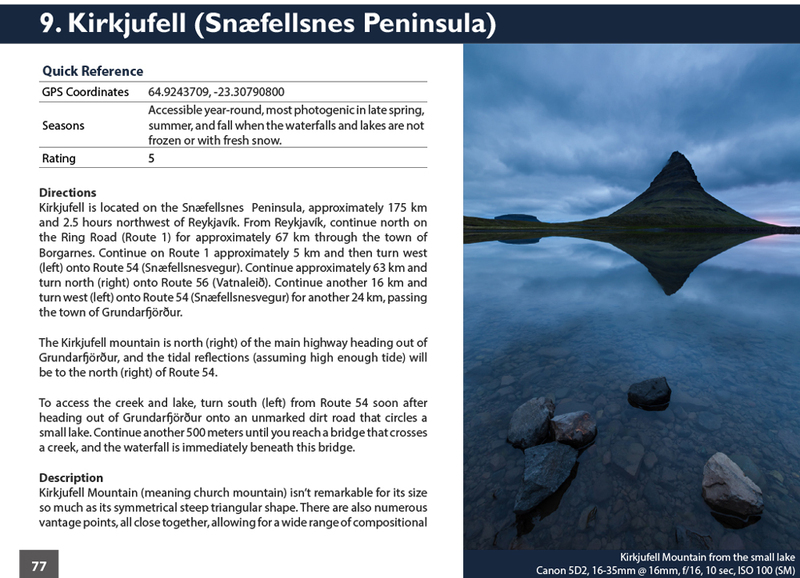 Information on more than 30 of the best photography locations in Iceland, with detailed directions and GPS coordinates for each. We also include a brief summary of more than 20 additional locations across Iceland. Location descriptions including directions, sample photographs, seasonal considerations, and advice on how to approach and photograph the subject. Over 130 high-quality photographs to both inform and inspire. Technical information (including exposure settings) is included for nearly every photo. Interviews with Justin Reznick, Miles Morgan, Ian Plant, David Thompson, Koveh Tavakkol, and Jim Patterson on subjects like aerial photography, visiting an ice cave, photographing an erupting volcano, photographing puffins, photographing the aurora borealis, and planning your first trip. Travel information, including lodging and transportation basics, seasonal variations, and weather information to help you get started in planning your trip. Tips for choosing when to visit Iceland for a landscape photography trip, plus sample itineraries. 127 full-size high resolution pages, ready for viewing on your tablet, computer monitor, or phone. Forever Light is delivered as a PDF file for immediate download. This ebook is perfect for any photographer planning to visit (or re-visit) Iceland, and will also appeal to any non-photographer interested in Iceland’s natural scenery. We developed this e-book to be the guide we wished we had for our first trip to Iceland and based on overwhelmingly positive reviews, we seem to have succeeded! Below is a sample gallery showcasing a small portion of the images that are in this e-book. The e-book contains many more, at higher resolution, with directions and information for each. You can also see many more of the photographs we have taken on our Iceland trips in our photography portfolios.